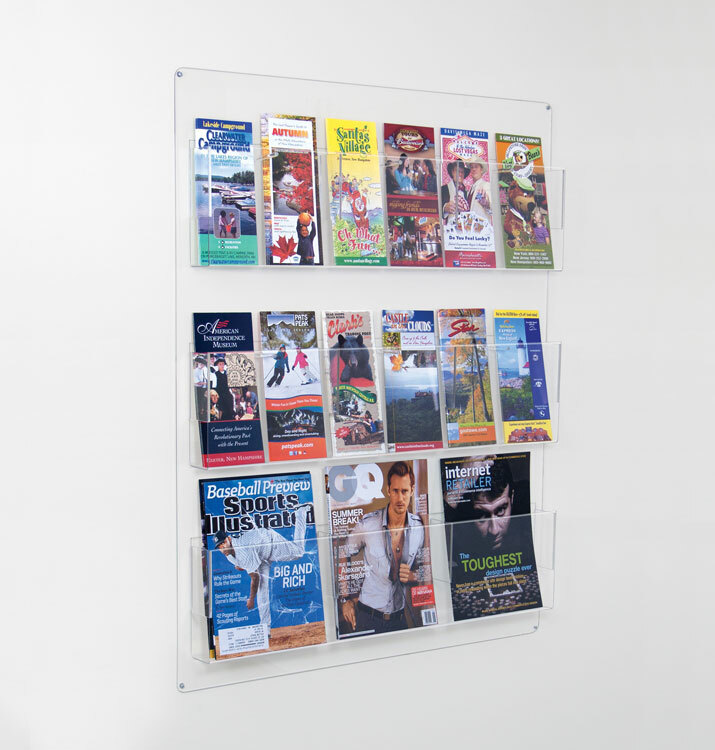 An attractive acrylic brochure display is ideal for high traffic customer areas. 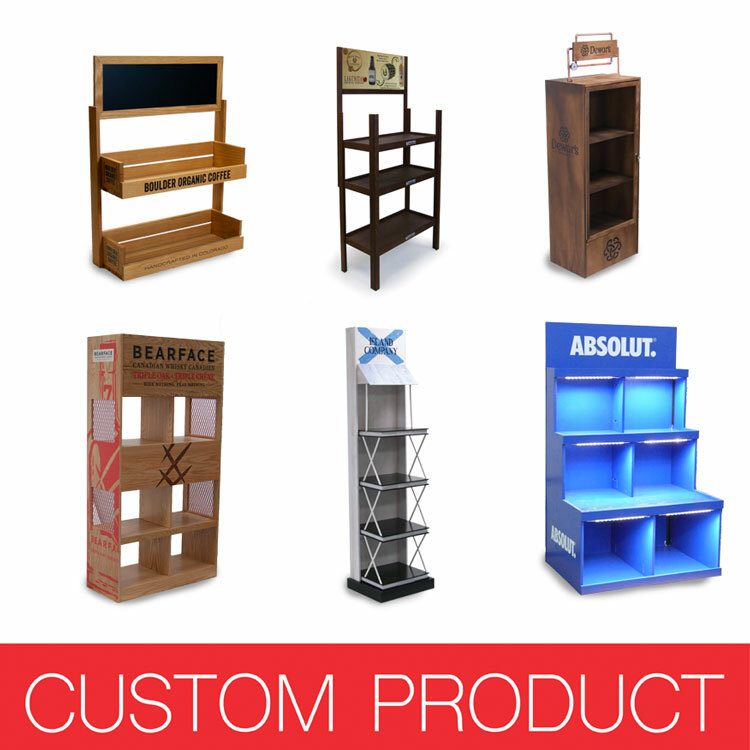 Use as a catalog rack in your lobby or waiting areas. This eye-catching design makes this perfect for advertising promotions & services. 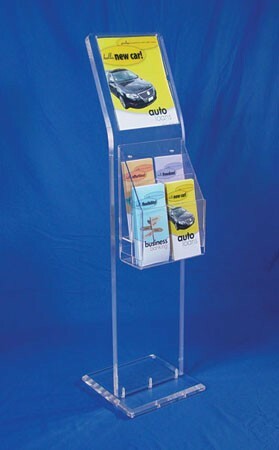 Quality acrylic brochure display is made from solid 1" thick clear acrylic. Each acrylic stand has an 8.5"w x 11"h header for ion of your signs or graphics and an adjustable 4-pocket literature attachment with snap out peg dividers. Easy assembly. The removable peg dividers in the 4-pocket adjustable literature holder easily convert the pockets to hold letter sized (8-1/2x11) material. With the peg dividers in, the pockets accommodate 4"x9" brochure sized material. Stands 48"h.
An attractive acrylic brochure display is ideal for high traffic customer areas. Use as a catalog rack in your lobby or waiting areas. This eye-catching design makes this perfect for advertising promotions & services. 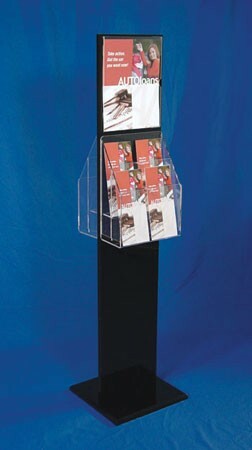 Quality acrylic brochure display is made from solid 3/4" thick black acrylic with polished edges. 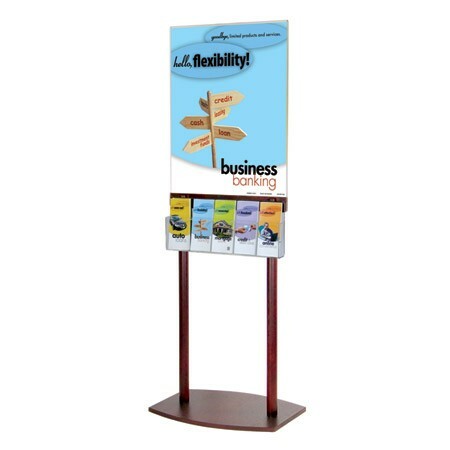 Each acrylic stand has an 14"w x 11"h header for insertion of your signs or graphics and an adjustable 6-pocket literature attachment with snap out peg dividers. Easy assembly. The removable peg dividers in the 6-pocket adjustable literature holder easily convert the pockets to hold letter sized (8-1/2x11) material. With the peg dividers in, the pockets accommodate 4"x9" brochure sized material. 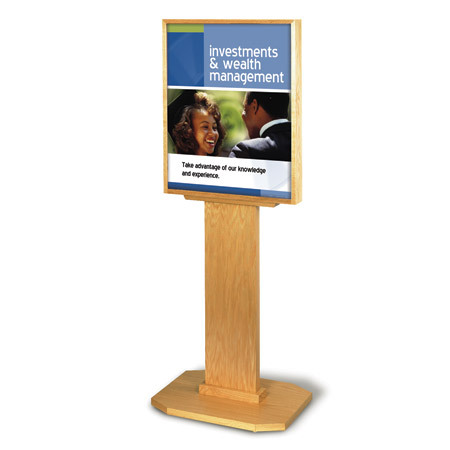 Stands 48"h.
An attractive acrylic brochure display is ideal for high traffic customer areas. 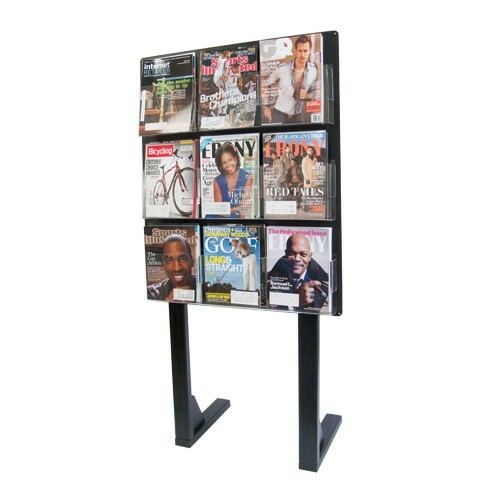 Use as a catalog rack in your lobby or waiting areas. This eye-catching design makes this perfect for advertising promotions & services. 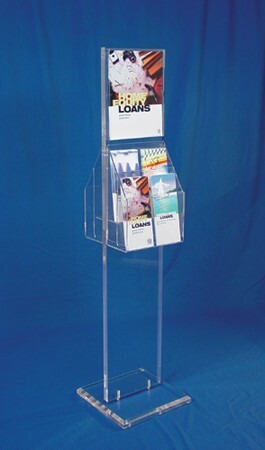 Quality acrylic brochure display is made from solid 1" thick clear acrylic. Each acrylic stand has an 14"w x 11"h header for ion of your signs or graphics and an adjustable 6-pocket literature attachment with snap out peg dividers. Easy assembly. The removable peg dividers in the 6-pocket adjustable literature holder easily convert the pockets to hold letter sized (8-1/2x11) material. With the peg dividers in, the pockets accommodate 4"x9" brochure sized material. Stands 48"h.
Available in 5 finishes! This beautiful convex floor display comes complete with (2) acrylic faceplates. 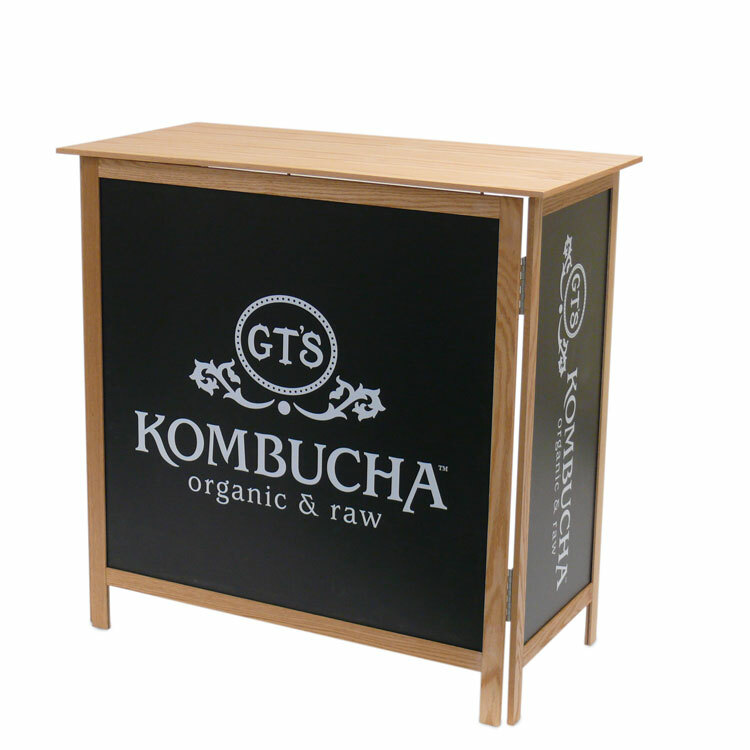 This well constructed floor display stands 74"h and is perfet to display one of our 22"w x 36"h multi-colored magnetic rate displays or high quality promotional graphics. Stands 74"h.
This elegant & eye-catching oak floor poster stand displays any of our standard 22"w x 28"h posters in a highly polished clear acrylic sign holder. Posters may be inserted back-to-back for double-sided viewing. Easy assembly. The base is 24"w x 18"d to provide excellent stability. 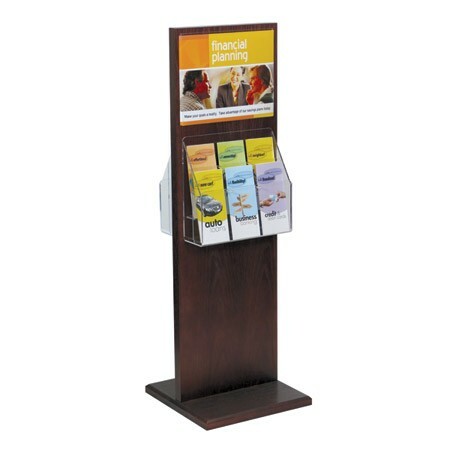 Includes a 5 pocket brochure holder to display other literature. Stands 67"h.
Available in 5 finishes. 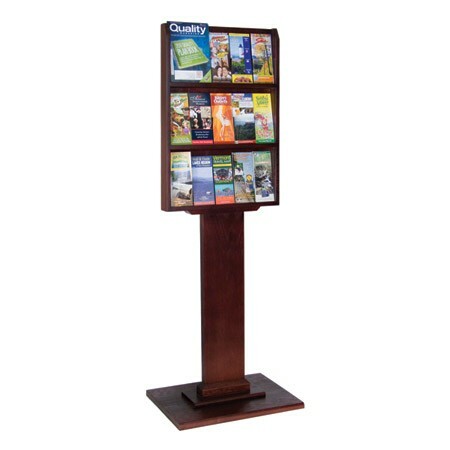 This hand crafted solid wood floor literature dispenser will class up your display area. The 15 pockets display 4"x9" brochures. 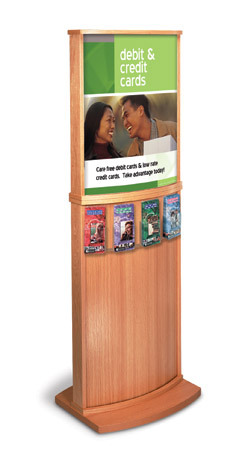 An attractive acrylic brochure display is ideal for high traffic customer areas. Use as a catalog rack in your lobby or waiting areas. This eye-catching design makes this perfect for advertising promotions & services. 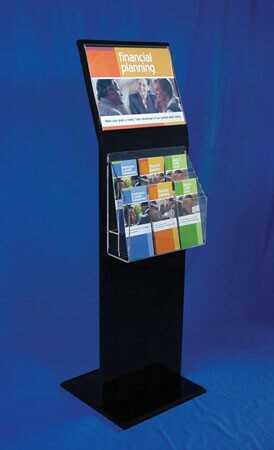 Quality acrylic brochure display is made from solid 3/4" thick black acrylic with polished edges. Each acrylic stand has a 8-1/2"w x 11"h header for insertion of your signs or graphics and an adjustable 4-pocket literature attachment with snap out peg dividers. Easy assembly. The removable peg dividers in the 4-pocket adjustable literature holder easily convert the pockets to hold letter sized (8-1/2x11) material. With the peg dividers in, the pockets accommodate 4"x9" brochure sized material. Stands 49"h.
Available in 5 finishes! This beautiful convex floor display comes complete with (2) acrylic faceplates. 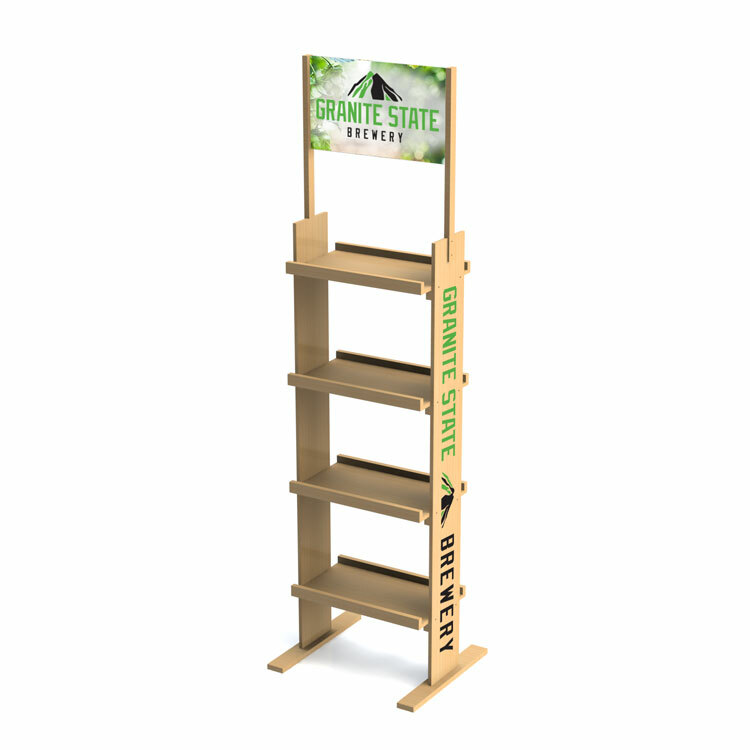 This well constructed floor display stands 66"h and is perfect to display one of our 22"w x 28"h multi-colored magnetic rate displays or high quality promotional graphics. 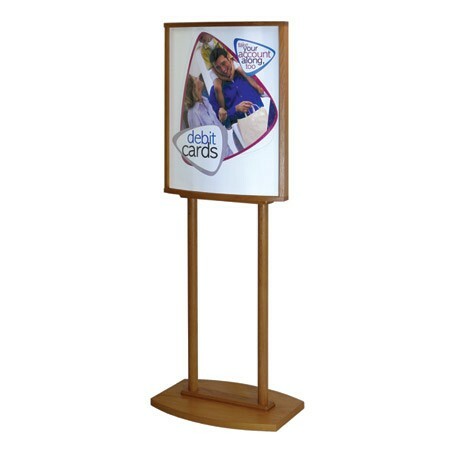 Stands 66"h.
This durable & attractive floor frame can be used with one or two posters for double-sided viewing. 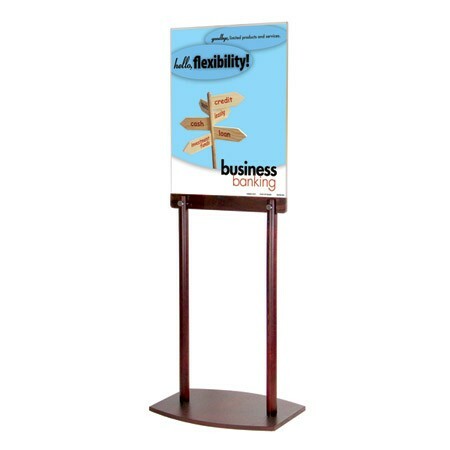 A side loading clear acrylic poster holder connects to the black PVC legs & base with two decorative bolts. The base is 24"w x 18"d to provide excellent stability. Comes complete with wheels. 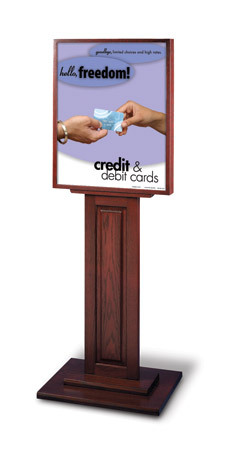 An attractive acrylic brochure display is ideal for high traffic customer areas. 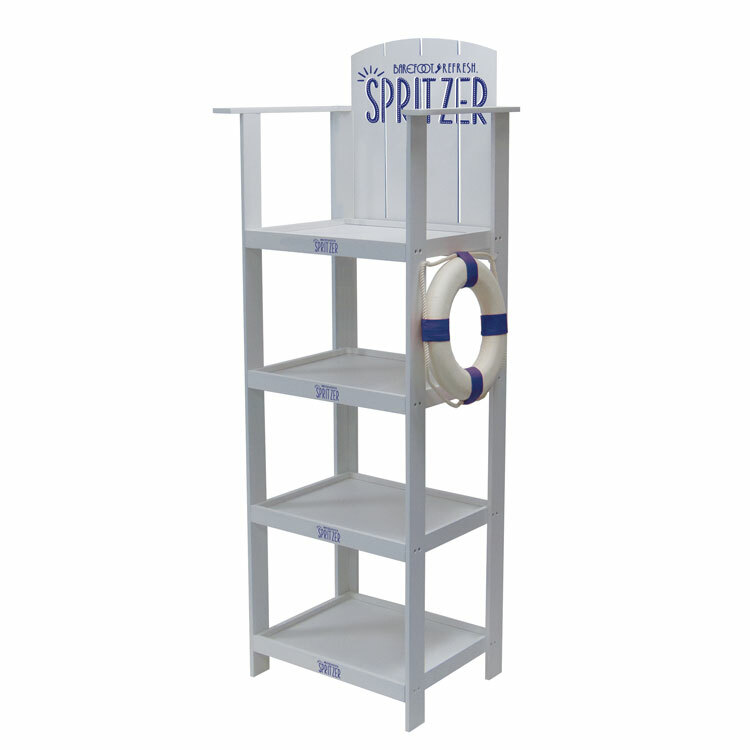 Use as a catalog rack in your lobby or waiting areas. This eye-catching design makes this perfect for advertising promotions & services. 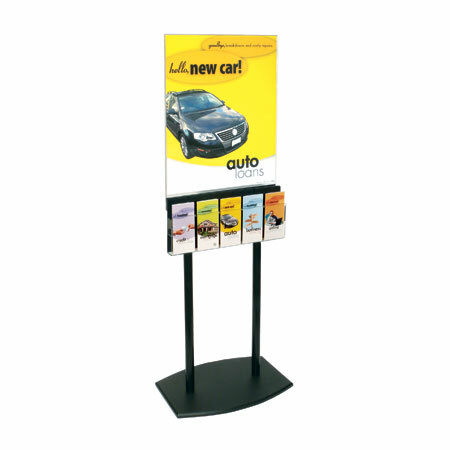 Quality acrylic brochure display is made from solid 3/4" thick black acrylic. 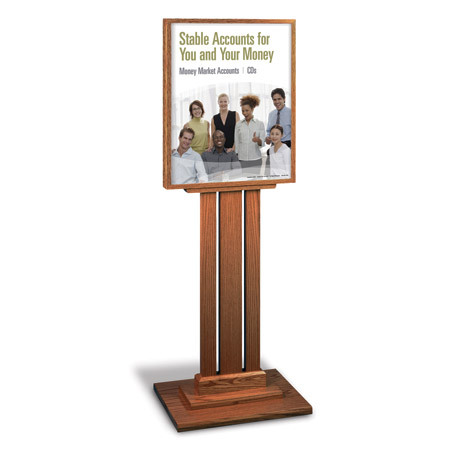 Each acrylic stand has an 8.5"w x 11"h header for insertion of your signs or graphics and an adjustable 4-pocket literature attachment with snap out peg dividers. Easy assembly. The removable peg dividers in the 4-pocket adjustable literature holder easily convert the pockets to hold letter sized (8-1/2x11) material. With the peg dividers in, the pockets accommodate 4"x9" brochure sized material. 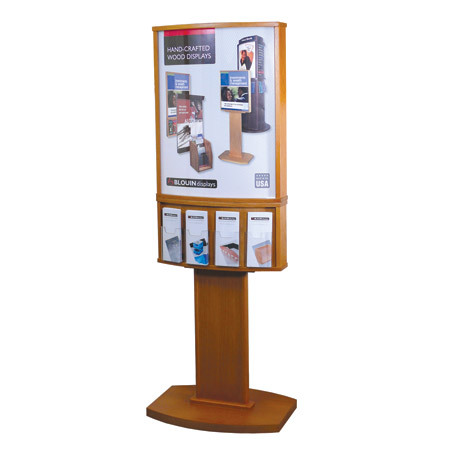 An attractive acrylic brochure display is ideal for high traffic customer areas. Use as a catalog rack in your lobby or waiting areas. This eye-catching design makes this perfect for advertising promotions & services. 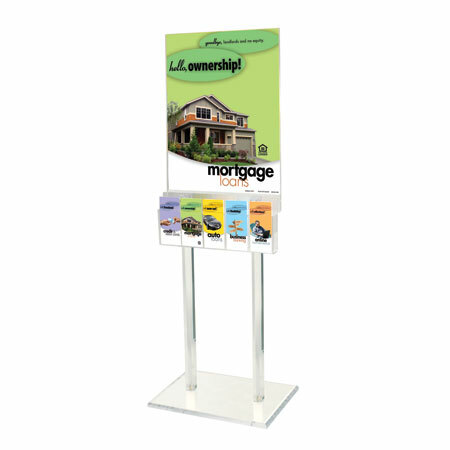 Quality 2-sided acrylic brochure display is made from solid 1" thick clear acrylic. Each acrylic stand has an 8.5"w x 11"h header for insertion of your signs or graphics and (2) adjustable 4-pocket literature attachments with snap out peg dividers. Easy assembly. The removable peg dividers in the 4-pocket adjustable literature holder easily convert the pockets to hold letter sized (8-1/2x11) material. 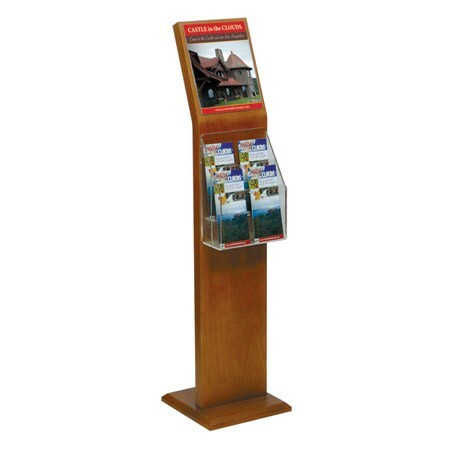 With the peg dividers in, the pockets accommodate 4"x9" brochure sized material Stands 49"h.
This solid oak convex floor poster holder stands on two posts legs. It accomodates 22x28 inserts and an acrylic faceplate to protect your inserts. 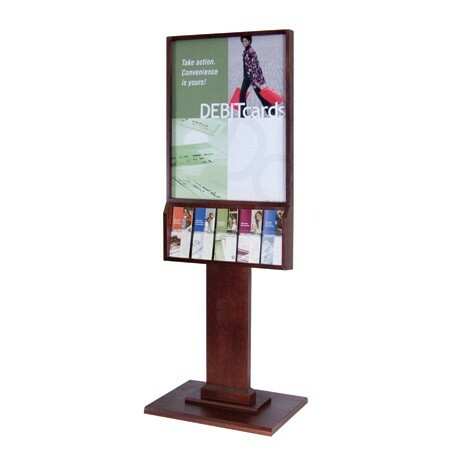 Stands 67-1/2"h.
Solid Oak 1-sided floor-standing poster holder holds 22"w x 28"h s and comes complete with a 5-pocket literature dispenser & clear acrylic face plate. 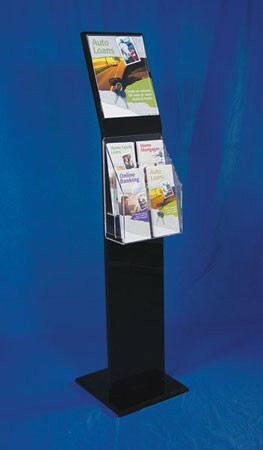 The literature dispenser holds 4"w x 9"h brochures. Stands 65.5"h and is available in 5 finishes. Display your sign and literature in this stylish display. 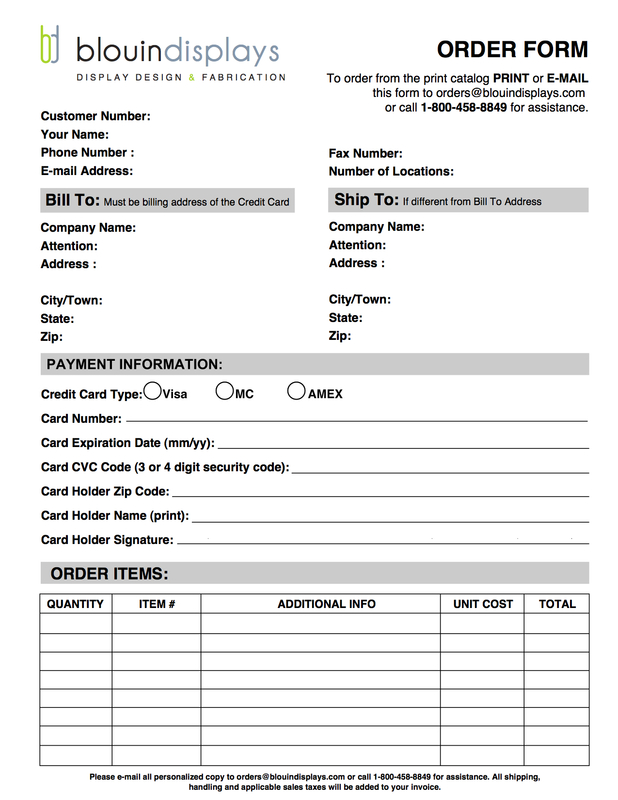 This is ideal for showrooms and retail space. Acrylic sign holder and literature holder with removable peg dividers for 4"w and 8-1/2" literature is included. Oak veneer laminate is available. Choose between black, cherry, mahogany, light oak and golden oak. This elegant & eye-catching oak floor poster stand displays any of our standard 22"w x 28"h posters in a highly polished clear acrylic sign holder. Posters may be inserted back-to-back for double-sided viewing. Easy assembly. The base is 24"w x 18"d to provide excellent stability. Stands 67"h.